We are glad to hear that Ulsan Dong-gu District government (“Dong” means East, “gu” means District) is taking action to shut down illegal dog farm and is working together with the Busan Korea Alliance for the Prevention of Cruelty to Animals (KAPCA) in this effort. We are grateful to both Busan KAPCA and the Ulsan Dong-gu. We look forward to seeing more proactive actions by Ulsan to eradicate the illegal and horrendous dog meat industry operating in their city. Below is a news report shared on Facebook by Busan KAPCA on March 12. Click HERE to see the Busan KAPCA’s Facebook post in Korean. Click HERE for Sister City Campaign – Ulsan, South Korea – Portland, Oregon. 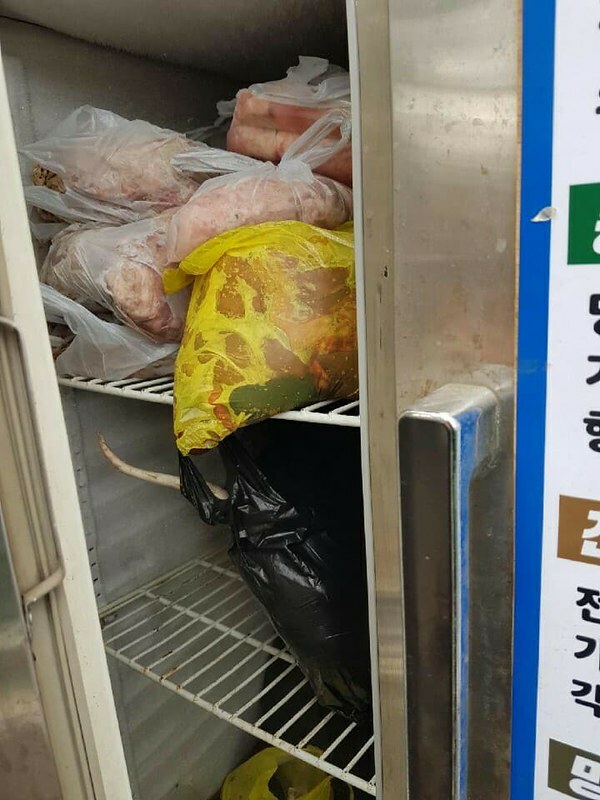 Click HERE for “Ulsan Dog Meat Market illegal dog slaughter… Knife stuck in throat, gasping in agony”. 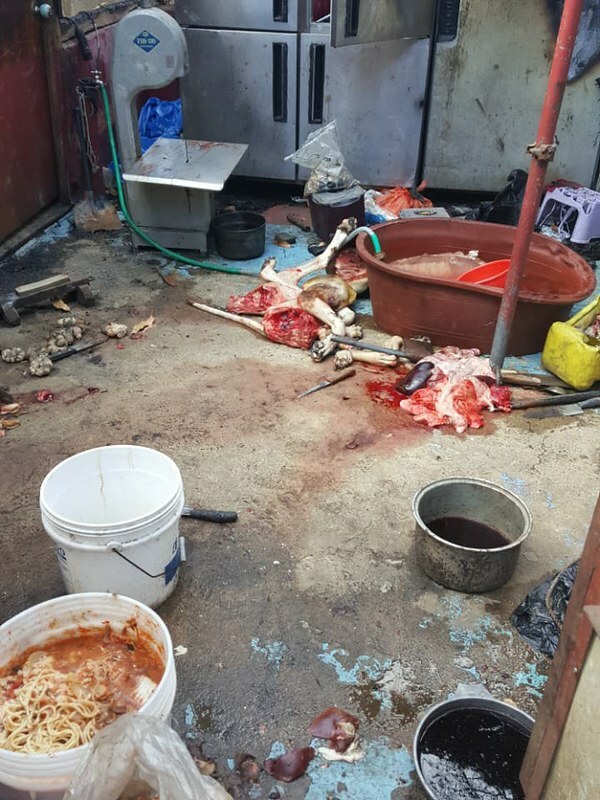 Busan KAPCA shut down this dog farm with the cooperation of the local government. 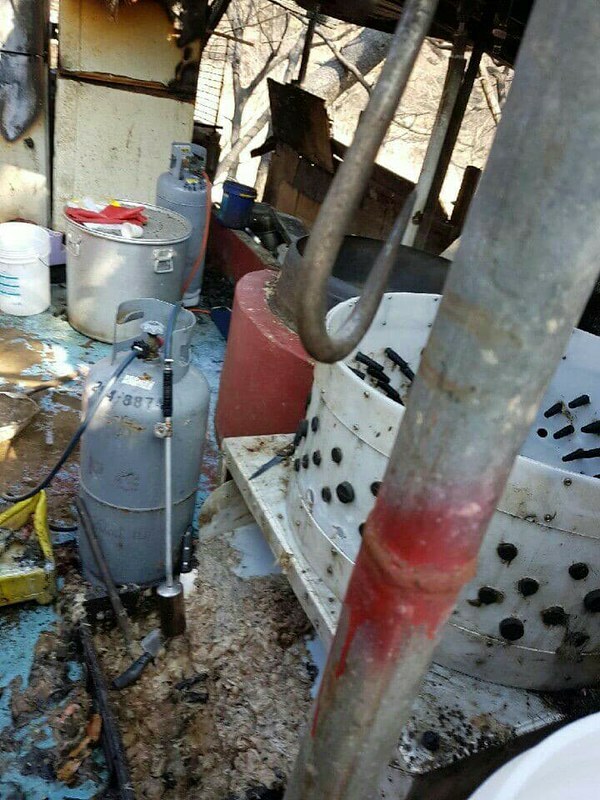 While investigating the cause of a February 8th fire at Yeompo-san mountain, the Ulsan Dong-gu District government made a presumption that the dog farm was the cause and contacted us, requesting that we work together to close down the farm. 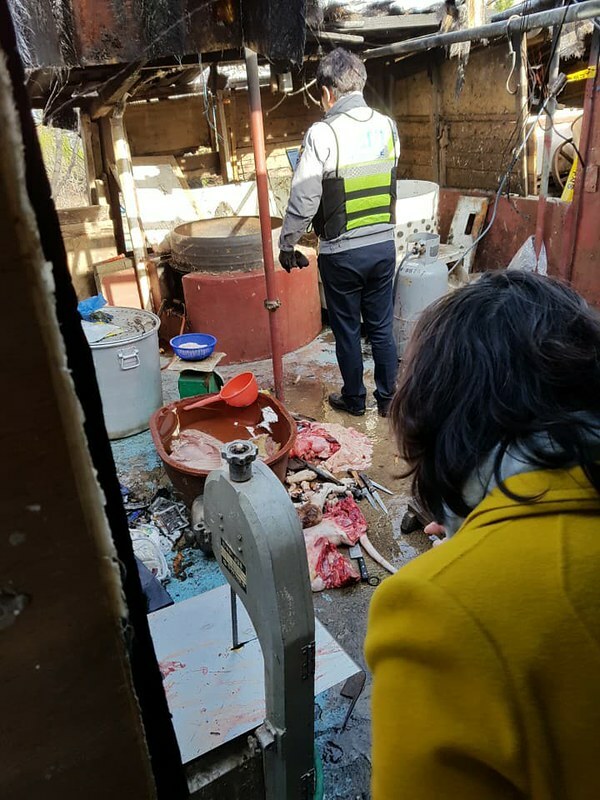 When our Ulsan team visited the dog farm site together with the District office staff and police, the dog farmer was in the middle of the slaughter (cutting up) process and the scene was gruesome. Pieces of dog carcasses were scattered everywhere; it was very bloody, and the dog farmer ran away as we raided. 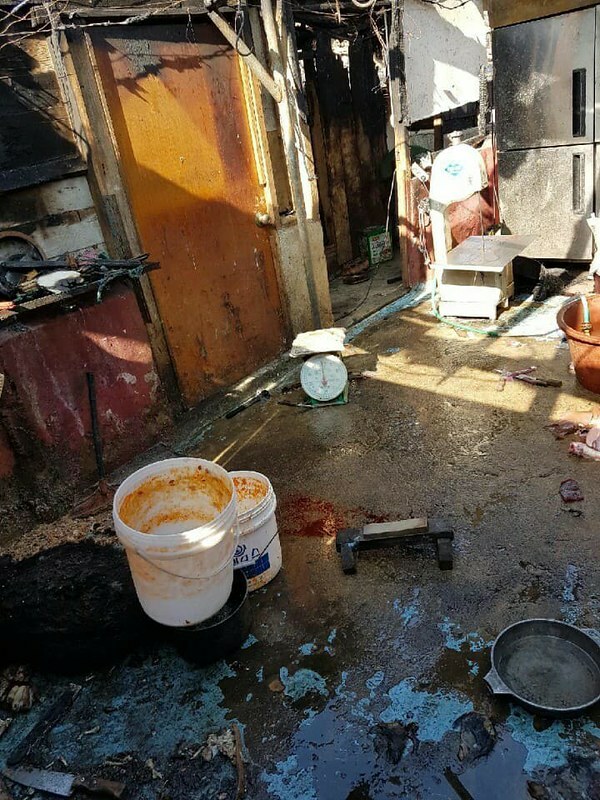 There had been about 30 dogs at the time of the fire but only 12 dogs remained because of the ongoing slaughter. We pray that the dogs killed rest in peace. 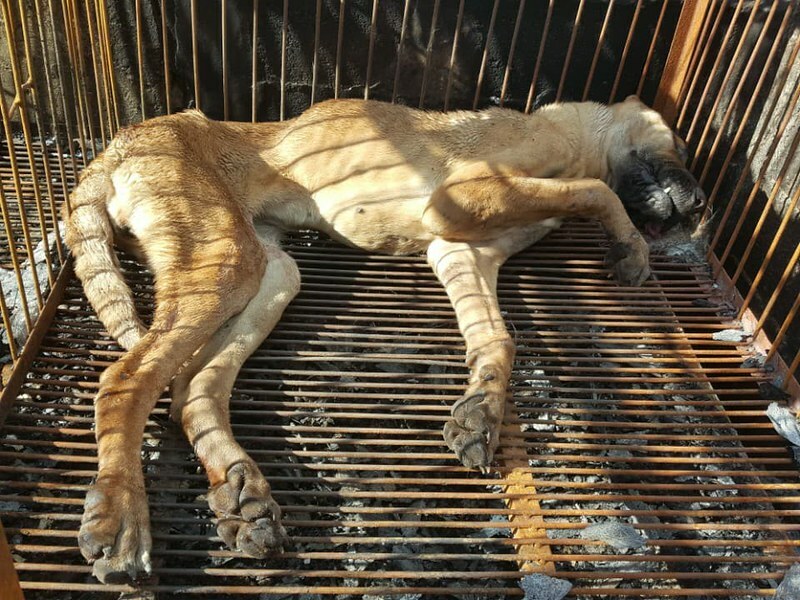 Today, the dog farmer signed an agreement to shut down the dog farm and to release the remaining dogs to the Dong-gu District. At the request of the Dong-gu District office, we sent a memorandum documenting the violation of laws to the district office and they have filed the complaint with the police. The district office will also take administrative measures. We hope you can help with the adoption of these 12 dogs released by the dog farmer. To make the Ulsan Dong-gu District clean and beautiful, district staff members are currently working hard to shut down this dog farm; we have never seen local government work so hard on an effort like this before. Please send your message of support and encouragement to Ulsan Dong-gu District Office. Let’s recognize them for their effort. This is such great news! I hope all farms will be closed down and cruelty to animals will stop. Please keep the good work. Thank you. Bitte schliessen sie die hundefarm.es sind lebewesen mit gefühlen!! I HOPE ALL THOSE TERRIBLE FARMS OF INNOCENT ANIMALS CLOSED. IT IS A SHAME THAT PEOPLE COULD EAT THAT MEAT. DO NOT STOP IN ALL THE WORLD TO CLOSE ALL THOSE FARMS OF CRUELTY AGAINST ANIMALS.